The San Francisco Giants lost their season opener to the Arizona Diamondbacks after going through a humiliating and on-brand bullpen collapse in the ninth inning. Whatever. Nobody cares how the game ended, because Madison Bumgarner was on the field. What Bumgarner did yesterday evoked visions of LeBron James in the 2015 NBA Finals—a thrilling but ultimately doomed attempt to almost singlehandedly pull his team to victory. Bumgarner threw five perfect innings for the Giants and finished with 11 strikeouts in seven innings. He also kept his team in the game with two big home runs. Bumgarner was breezing through the Diamondbacks lineup, averaging 10 pitches per inning through four, while his counterpart, Zack Greinke, struggled to retire the Giants with a reasonable efficiency. Bumgarner lost his perfect game bid after surrendering a triple to Diamondbacks catcher Jeff Mathis (which left fielder Gorkys Hernandez chased awkwardly around the corner of the park), and then gave up a two-run home run to A.J. Pollock, tying the game at three. Giants manager Bruce Bochy left Bumgarner in to bat in the seventh, and he rewarded that decision with his second dinger of the game. Derek Law came on to relieve him in the eighth, and the Giants collapsed from there. Bumgarner is going into his seventh full season with the Giants—he was a June call-up in 2010 and made a few appearances in 2009—and he seems to be getting better, stronger, more deadly on the mound and at the plate. This is somewhat shocking given the work he’s already put in during his career. He’s thrown more than 200 innings per regular season since 2011, tossing a career-high 226.2 innings in 2016 (fourth most in the league). Since 2011, he’s held a 1.079 WHIP, 3.00 ERA, 3.07 FIP, and a 122 ERA+. And of course, we all remember his performances during the 2014 playoffs, during which he posted a 1.03 ERA and basically turned into the Grim Reaper, come to earth to claim the souls of the Kansas City Royals. I mean, come on. He was tormenting Greinke at the plate yesterday. 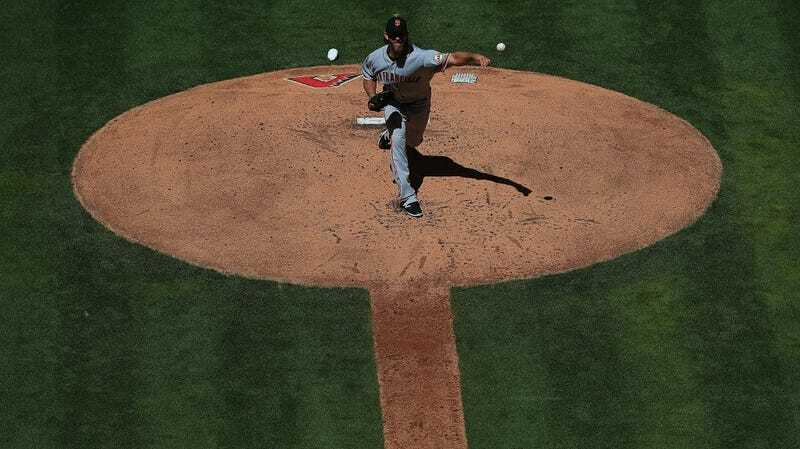 The Diamondbacks’ ostensible ace looked afraid to throw a pitch in the zone to his counterpart, which earned Bumgarner a walk in the second inning. Their next meeting, Greinke tried to get Bumgarner with a two-seam fastball high in the zone, which Bumgarner smoked for a home run. As soon as the ball left the bat, Bumgarner showed a rare smile, looking proud as he rounded the bases. Bumgarner is now the first Giants player to hit two home runs on opening day since the one and only Barry Bonds did it in 2002. He joins Bonds, Matt Williams, and Willie Mays as the only San Francisco Giants to hit multiple home runs on opening day in Giants history—period. He’s clearly swinging for home runs at this point—he struck out 43 times in 86 at-bats last season—but it’s a joy to behold. With the National League pretty much assuring a hole in the lineup in the nine spot, the risk-benefit analysis comes out pretty well in the favor of Bumgarner swinging for dingers rather than bloopers. Bumgarner’s mythological persona—the one that leaves us imagining him on his farm in North Carolina, slinging around bales of hay, cutting down forests all by himself, and taming wild horses—sometimes feels a little too on the nose. But then he gives us a game like yesterday’s, and the myth doesn’t go far enough. Maybe he needs to start wearing his Carhartt overalls while he destroys the confidence of grown men on the field. The Giants’ first game of 2017 was disappointing in all the same ways that last season was. They threw away Bumgarner’s heroics, left the bases loaded in the top of the ninth inning, and somehow infected new closer Mark Melancon with their late-inning sickness. The good news for Giants fans is that there are 161 more games to play. The better news is that Madison Bumgarner will be involved in about 30 of those games.